Fight Tennis is a fangame currently developed by Mr. Yoshbert, and originally his entry for the Minigame Competition #2 - 2016. In the Minigame Competition, Fight Tennis tied with Mario Pong for second place. Fight Tennis can be described as an action-orientated take on the 1972 arcade game, Pong. A booth for Fight Tennis was released on the Nintendo Community Fangame Convention 2016. It stated that there would be more playable characters and items, and a demo would be coming soon. Fight Tennis plays like Pong, except that instead of trying to get the ball through the opponent's paddle and then score a point, players have to take down a wall that is behind the opponent's paddle, and also protect their wall from the ball. When the ball hits the wall, it gets weaker, and when it receives enough damage, the opponent will score a point and then the next round starts. The number of rounds can be adjusted. When the last round ends, the player with the most points wins. 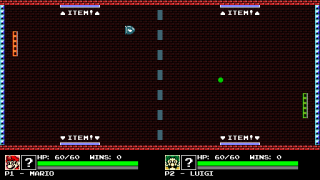 If items are toggled on, players can receive a random item by having the ball hit one of the four pads that are on the ceiling and floor, if they are blue. Whoever gets to receive it depends on who deflected the ball last. Players can either fight against a CPU or another player. Super Mushroom - Makes their wall a bit stronger. Green Koopa shell - Can be held by the user's paddle paddle, and then released. The Koopa shell can be able to hit the walls and get deflected by the paddles. After a few bounces, it will disappear. If it hits a wall, then it will also disappear. Fire Flower - For a short amount of time, the user can shoot fireballs. They can damage the opponent's wall, although they'll also get destroyed if they hit the opponent's paddle. Bullet Bill - A Bullet Bill gets sent out of the user's paddle. Like the fireballs, they can be destroyed if the hit the opponent's paddle, although they'll give damage to the opponent's wall when collided within. Spring - Sends the ball back. This page was last edited on 27 December 2016, at 02:59.